The global Automotive Biometric Access System market is expected to attain a market value of USD 1,236.8 million by 2022, growing at a CAGR of 16.5% during the forecast period (2016-2022). The biometric automotive vehicle access system market is segmented into fingerprint recognition, voice recognition, Irish recognition and others. The others market includes gesture recognition, face recognition, and palm recognition, etc. Fingerprint recognition type is the most common type of biometric access system used within the vehicles to securely access the car and hence, held the maximum market share of approximately 50% in 2014. In a vehicle, the biometric system provides security based on the biological characteristics that include fingerprint recognition, voice recognition, iris recognition and others. These patterns are different for every human being, and hence, make vehicle access more secure, for instance in unlocking gate and windows, navigation access and others. The easy to use and easy to install features has made the biometric access systems a prominent product for vehicles, making the system fast and reliable. Such features would drive the market growth of automotive biometric access systems. The technology finds its applicability not only in luxury class vehicles but also in the mid-size and lower end vehicles in developed regions such as Germany, US and others. Based on characteristics type, the market is segmented into physiological and behavioral. In 2014, physiological characteristic segment dominated the global automotive biometric access system market. Based on the product sale, the market is segmented into OEM and Aftermarket. Biometric access system is largely used in consumer vehicles, eventually making it the highest revenue generating segment based on end user type. 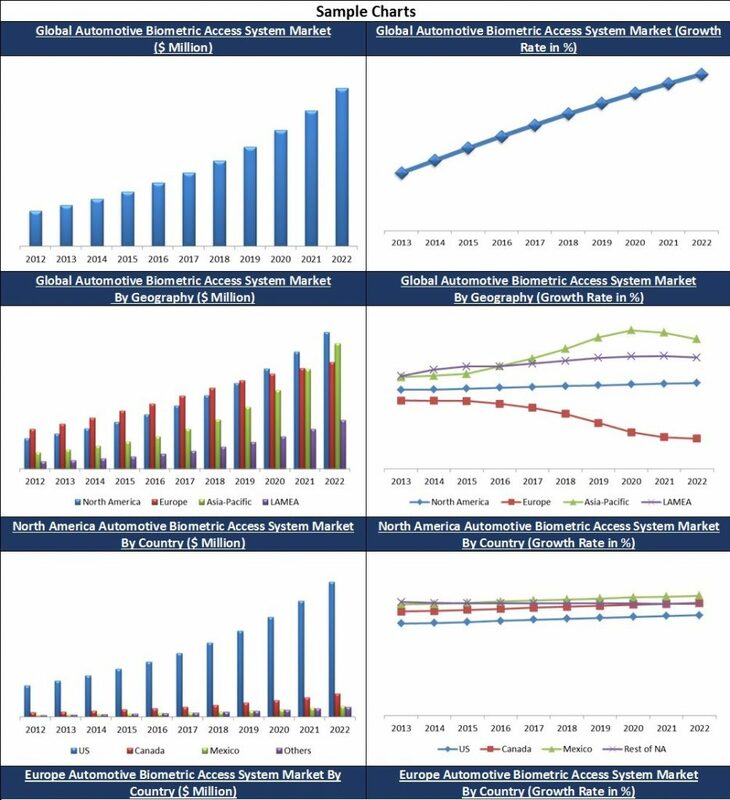 Further, for better analysis and understanding the market penetration of automotive biometric access system market, the market is bifurcated into different geographies and countries including North America (U.S., Canada, Mexico and Others), Europe (Germany, U.K., France, Russia, Spain, Italy and Others), Asia-Pacific (China, Japan, India, South Korea, Singapore, Malaysia and Others) and LAMEA (UAE, Saudi Arabia, Brazil, Argentina, South Africa, Nigeria and Others). In 2014, Europe dominated the global automotive biometric access system market, holding approximately 41% share in terms of revenue. The presence of leading automotive manufacturers and increasing demand for security within the vehicles has helped the region to be the highest revenue generator across all geographies. Some of the prominent companies profiled in the global Automotive Biometric Access System market are Delphi Automotive Plc., Ford Motors Co., Fingerprint Cards AB (publ), Synaptic Incorporated, Robert Bosch GmbH, NEC Corporation, Hitachi, Ltd., Siemens AG, VOXX International Corporation and Panasonic Corporation.